The function of the diesel fuel pressure gauge is to show the changes in the oil pressure of the lubricating system. The oil pressure is an important indicator of the lubrication system, its level is a sign of the strength of the lubrication. General engine fuel pressure is specified in the range of 0.15-0.3 MPa. 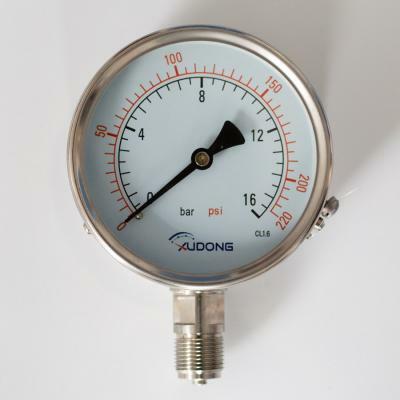 There are two kinds of common diesel fuel pressure gauges: elastic tube diesel fuel pressure gauges and electric heating diesel fuel pressure gauges. The elastic pipe diesel fuel pressure gauge consists mainly of a curved, oval shaped brass elastic tube and head. One end of an elastic flat tube (also known as an expansion tube) is connected by a tubing to a lubricating oil channel, the other end is closed, and the connecting rod is connected with the fan gear. The shaft is equipped with a pointer and a gear, and the gear is engaged with the fan-shaped gear. After the starting of the internal combustion engine, when the oil pressure in the oil channel rises gradually, the oil enters the elastic flat tube, making the elastic flat tube deformed in the direction of straightening. When the sector gear is driven by the connecting rod, it rotates in an anticlockwise direction, so the gear drives the pointer to rotate in a clockwise direction, so that the pointer points to the scale with high oil pressure. When the oil pressure in the oil channel is reduced, the elastic flat tube is closed inward, through the connecting rod and the fan-shaped gear, so that the gear and the pointer are rotated in the counter clockwise direction. The pointer then points to the lower scale of the oil pressure. The internal combustion engine stops working, the pressure in the elastic tube disappears and the pointer goes back to zero. The electric diesel fuel pressure gauge of the electric heating diesel fuel pressure gauge is to control the current size by using the change of oil pressure. Then the thermal effect of the current is used to deform the bimetal strip and move the needle to measure the value of the oil pressure. The electric diesel fuel pressure gauge consists of two parts: the sensor and the indicator table. The sensor is connected with the main oil channel of the internal combustion engine, and the indicator is mounted on the instrument panel, which is connected by a wire.